- PBA Galleries will sell Americana, Cartography, and Travel & Exploration on 5 November. Highlights include the nine volumes of the fourth and fifth series of Peter Force's American Archives (1837-1848), including a flawed copy of the folding Declaration of Independence (est. $20,000-30,000); a clipped signature of Billy the Kid (est. $10,000-15,000); and some Lewis & Clarkiana. - The annual Skinner Fine Books & Manuscripts sale catalog [PDF] is up; the auction will be held on Sunday 15 November at 11 a.m. in Boston. A bunch of autograph/manuscript items leads off the sale, including Lot 17 (a lock of the hair of John Brown, est. $5,000-7,000, picture on p. 11 of the catalog); Lots 40-41 (George Armstrong Custer letters, est. $5,000-7,000 and $8,000-10,000); Lot 96 (a David Hume letter regarding Rousseau's letters to him, est. $10,000-15,000); Lot 131 (a fantastic Martin Luther letter, est. $15,000-25,000); Lot 151 (an Isaac Newton manuscript on ancient European history, est. 10,000-15,000); Lot 184 (a Peter Stuyvesant letter, est. $20,000-30,000); Lot 187 (two manuscript pages of Thoreau's A Week on the Concord and Merrimac Rivers, est. $4,000-6,000). The high spot of this section is expected to be Lot 179, a large collection of material relating to Albert Schweitzer (est. $35,000-55,000). Among the books, highlights include Lot 252 (Barton's 1817 Vegetable Materia Medica of the United States, a presentation copy to Commodore William Bainbridge, est. $6,000-8,000); Lots 276-295 (a number of Conrad titles, including several signed/inscribed copies); Lot 331 (a set of early printings of Lewis Carroll's Wonderland works, bound uniformly, est. $3,500-4,500); Lot 359 (a five-volume set of Gould's Birds of Great Britain, est. $60,000-80,000); Lot 363 (a book from the library of Nathaniel Hawthorne, est. $2,000-3,000); and Lot 397A (a first English edition of Jefferson's Notes on the State of Virginia, est. $20,000-30,000). A copy of my very favorite of Audubon's Birds, the Carolina Parakeet, will be Lot 575 (est. $25,000-35,000). Other interesting things in the final section include Lot 601 (a 1574 Sebastian Munster world atlas, est. $10,000-12,000) and Lot 602 (a 1705 Visscher atlas, est. $10,000-15,000); and Lot 617 (a famous and excellent 1755 map of North America, est. $15,000-20,000). - The Last Founding Father: James Monroe and a Nation's Call to Greatness by Harlow Giles Unger (Da Capo, 2009). Publisher. Tonight at 8 p.m. you can listen to a live streaming version of the 1938 broadcast of Orson Welles' adaptation of H.G. Wells' "The War of the Worlds," which alarmed some listeners when it first aired, 71 years ago tonight. Today's Sotheby's London sale of Books and Manuscripts from the English Library of the 5th Earl of Rosebery, went very well. The total take was £1,522,303. The big story was that trove of Byron letters to his friend Francis Hodgson (lot 19, estimated at £150,000-180,000); that sold for a whopping £277,250 ($459,000), a record for letters or manuscripts by a British Romantic poet. More on this at Jacket Copy. Some other items which sold well were John Speed's The Theatre of the Empire of Great Britain (1676) (lot 107, estimated at £50,000-60,000), which made £69,650; Christopher Saxton's 1579 atlas of England and Wales (lot 99, estimated at £40,000-60,000 and sold for £73,250); and for a real surprise, John Rocque's 1763 Set of Plans and Forts in America (lot 95, estimated at £7,000-10,000). That more than quadrupled its estimate, fetching £46,850. Lot 1, a manuscript copy of James Abercromby's An Examination of the Acts of Parliament relative to the trade and the government of the American Colonies, also did very well; it was estimated at £6,000-8,000 and sold for £49,250. A nice association copy of Bligh's narrative (lot 10) also made £49,250, better than tripling its estimate. A four-volume collection of broadsides and tracts relating to the English Civil War (lot 46) sold for £58,850 (estimated at £8,000-12,000). Sir William Hamilton's work on the volcanos of Sicily (lot 54) made £94,850, almost doubling its estimate. Finally, John Dee's copy of John Hardyng's Chronicle (lot 56) made £55,250, doing much better than its £10,000-15,000 estimate. Quite a day over there! One of the neat things I ran across while doing the "unitemized libraries" sweep of Virginia probate records was the inventory [PDF] of Mt. Vernon taken after George Washington's death. I'd seen this inventory in published form as I worked on Washington's collection and had added the entries from the inventory to each record (sample). But with the raw transcription of the inventory I noticed that the book-list was separated out by case (Nos. 1-8), plus other books "On the Table." So for each section I made a collection in Washington's LT catalog, allowing users to - at least to some degree - "recreate the bookshelves" at Mt. Vernon. The book lists appear on pp. 8-19 of the inventory, and then you can use the relevant collection (Case 1, for example, or On the Table) to pull up the books in each (full list of collections is at the top of Washington's profile page). Some caveats: Washington had a bunch of volumes of bound pamphlets and other short works that are just listed in the inventory as "Miscellanies" or "Political Tracts," &c. Since there are so many of these, and they are scattered throughout the collection, it was not possible to assign those works to a "shelf." And occasionally you'll see a record that has been assigned to two bookcases; that's where part of a set (usually of a periodical) was in one place and the rest of it in another (as indicated in the record notes). One of the interesting things I noted is that with the exception of most of the books in French and German (which were kept together) there doesn't seem to be much rhyme or reason to the way the books were organized. Jefferson would have been appalled! (Of course Washington might have had a system that either was 'undone' by however the inventory-takers made the lists, or the books might have been disordered after his death, &c. - it's hard to say). It's the anniversary of the birth of James Boswell (29 October 1740), so why not take the opportunity to check out a new exhibit at Yale, "Really As It Was: Writing the Life of Samuel Johnson"? The show will run through mid-December, and there is an online component as well (quite a nice one, I must say). Stuart A.P. 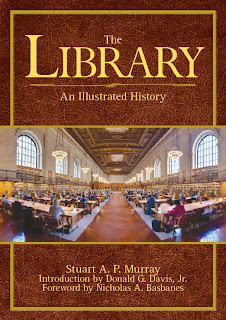 Murray's The Library: An Illustrated History (Skyhorse Publishing, 2009) is an extremely broad historical survey of libraries (and certain other aspects of the book world), with pictures. The first several chapters, focusing on the ancient world through the early modern period, are the strongest; after that, particularly in the chapters on American libraries during the colonial period through the twentieth century, Murray's narrative becomes both repetitive and disjointed, lending an air of choppiness to the text that mars the work rather severely. There are a number of small factual and typographical errors in the text which should have been edited out, and which draw the reader's attention (at least this reader's attention) away from the story. The third librarian of Congress was George Watterston, not Watterson, for example (why this jumped out at me I have no idea). Murray's book ends with a random survey of some fifty individual libraries and institutions around the world, some of which have already been discussed at length in the text. This section doesn't seem to be governed by any organizational scheme at all, and jumping all over the world for brief snippet profiles may not have been the most effective way to present this information. There is no concluding section to round out the work, which ends abruptly after the institutional profiles. I should say a word about the images, which are mostly well-chosen (although not always of the highest reproduction quality) and complement the text nicely. There are unfortunately no reference notes, and the "For Further Reading" section is poorly-formatted and surprisingly succinct. In the introduction, eminent library history scholar Donald G. Davis, Jr. sums up the challenges of a book like this: "The difficult choices to be made in preparation of a short work that reaches for such breadth and scope should not be underestimated. Telling the intriguing story of the production, transmission, preservation, organization, and utilization of cumulated human knowledge - and telling it in a style that appeals to the widest spectrum of readers - is both a challenging and a most worthy task. No one - from library historians and cultural scholars to the general public and young readers - will agree on what should be included in or omitted from the text and illustrations. Least of all will librarians themselves be of one mind - of that we can be sure! But the effort to tell this story, however sketchy and idiosyncratic, is well worth it." Just so. A flawed book, but a noble attempt nonetheless. The Intellectual Torch; developing an original, economical, and expeditious plan for the universal dissemination of knowledge and virtue; by means of free public libraries. Including essays on the use of distilled spirits. Emphasis added. You can read the work here. As I've been working on the Libraries of Early America project I often find myself coming across probate inventories or other records which don't list the specific contents of a person's library, but do at least mention the presence of books. Seeking a way to document these, I lighted on the idea of an "Unitemized Libraries" compilation. I've begun that compilation here, drawing on the body of probate transcriptions created as part of the Gunston Hall Plantation Probate Inventory Database (thanks to Gunston Hall for putting these online!). This encompasses more than 300 Virginia and Maryland probate inventories from 1740-1810, transcribed as PDF files. For each inventory, I've sussed out the spots where books are mentioned, and then placed the inventory either into the Unitemized Libraries page, or in the Collections to be Added section of the LEA wiki (which I like to call my permanent cure for boredom). "Green, Sarah (York County, VA). Inventory taken April 1759, entered 21 May 1759. Full Inventory. Total inventory value £338/17/2. - "A Parcel of old Books" ("In the Kitchen") - value £1, 10 shillings." Some of the entries are amusing (including Francis Hammersley's "A Quantity of Books", valued at £2 and Jeduthan Ball's "a pretty Large quantity of Books" valued at £15), but most are just something along the lines of "a parcel of books" or "44 Volumes of Books different Sorts." A few made me laugh just because of where the books were placed in the inventory: Col. Thomas Williams' "a parcel books" (value: 40 shillings) appears on the same line as "5 sheep" (value 37 shillings, sixpence). A couple depressed me, since it would be so fascinating to know more: Thomas Stone had a pretty hefty collection, with a "Law Library containing 530 Volumes" (value £454/1/4) plus the "Other Library containing 258 volumes bound & 121 pamphlets unbound" (value £85, 5 shillings). Henry Fitzhugh's "Catalogue of Books" was valued at £258/7/9, so it must have contained quite a number of volumes. I'm hopeful that I might be able to find out a little bit more about these larger collections, but the contents of most have been entirely lost to history. This is just the beginning. I'll be on the lookout for additional probate transcriptions and sources to add more pre-1825 libraries (I have another few files from other states to go through already), both unitemized and those with more details. Feel free to send along potential lists, as well. In the meantime, back to cataloging Dr. John Jeffries' library - lots of interesting and fascinating medical titles in this one. 1-2:30 pm. "Libraries and Education in the 21st Century: The Case of Cushing Academy" a talk by James Tracy, Headmaster, Cushing Academy, Ashburnham, Massachusetts, former headmaster, Boston University Academy with remarks by Christopher Ricks, Warren Professor of the Humanities, Co-Director, Editorial Institute, Boston University. Moderated by David Eckel, Professor of Religion, Director of the Core Curriculum, and Victor Coelho, Professor of Music, Associate Provost for Undergraduate Education. All events will be held in the Metcalf Trustee Center, One Silber Way, Ninth Floor. To get there, take the green line B-train to Blandford Street stop. This conference is free and open to the public. A reception will follow the last presentation. Co-sponsored by the New England Renaissance Conference and the Boston University Humanities Foundation. For more information, contact core@bu.edu or call 617-353-5404. Book Review: "Empire of Liberty"
The newest volume in the estimable Oxford History of the United States series is Gordon S. Wood's Empire of Liberty: A History of the Early Republic, 1789-1815 (Oxford University Press, 2009). Like the other titles in the series this one seeks to synthesize a chunk of American history into a single volume with a coherent narrative, aimed at a general audience - given the tremendous amount of literature which this (ahem, rather key) time period has spawned, the author's task here seems well nigh impossible. I'm pleased to say that Gordon Wood has succeeded admirably. This is at once a book which offers any interested student of history a "good read" overview of the era, while also providing specialists with an entirely suitable synthesis of recent scholarly treatments and debate. Empire of Liberty offers a delicate balance between political, diplomatic and economic histories while also paying heed (and not just lip service) to recent work which encompasses race, gender and social analyses as well. Wood's treatment of the early republic's political difficulties is evenhanded and fair, as is his explanation of the first party system and its origins. His chapters on the organizational of the first government, the early Supreme Court and the roots of judicial review were clearly two of his favorites to write, and the way he's managed to examine the paradoxes inherent in the way Jefferson and Madison governed was both quite apt and fascinating. His research base was clearly vast (the ten-page bibliographic essay clearly doesn't do it justice, but the footnotes will help), and he's drawn judiciously from the deep, wide pool of recent scholarship to create this far-reaching and able work. I'm sure that anyone, particularly anyone with an interest in this period, will find "something missing" from this book. I would have appreciated a closer look at literature, books, and libraries, and found the sections covering education rather succinct. I'm sure that others will offer up what they felt were the lacunae in Empire of Liberty. But on the whole, given the great constraints he was under, I can offer up nothing but praise for this effort. It's a delight to read (even though its 750-page bulk does make it a rather uncomfortable book to cart around as frequently as I'd have liked to), and a fine contribution to the series in particular and to scholarship more broadly. In the Autumn 2009 American Scholar, William Quirk has an essay titled "Living on $500,000 a Year: What F. Scott Fitzgerald's Tax Returns Reveal About His Life and Times." Drawing on income tax returns and Fitzgerald's manuscript financial ledgers, Quirk teases out some lessons about financial and literary history, as well as historical memory, which make his piece well worth a read. We watched the 1957 movie "Desk Set" last night - about a corporate reference department's qualms about a new "electronic brain" that they're afraid might take away their jobs. A useful reminder that the "human element" was - and always will be - important. And with that, here are your links and reviews for the week. - Haven't seen much press about this but ReadWriteWeb notes that the Internet Archive has launched BookServer, the goal of which is to "allow users to find, buy, or borrow digital books from sources all across the web." - In Time, a piece on how plagiarism-detection software has - supposedly - identified Shakespeare and Thomas Kyd as co-authors of The Reign of Edward III. - In today's Globe Matthew Guerreri discusses how the transcendentalists in 1830s-40s Boston were largely responsible for "bringing Beethoven to America," while columnist Sam Allis sets his rhetorical sights on the "Secret Six," the men who largely financed John Brown's activities in the late 1850s. - Nick has a neat post about Milton and censorship. - James Glanz writes in the NYTimes on recent historical reassessments of the Battle of Agincourt. - In ARTNews, Milton Esterow examines early Chinese copies of American paintings, particularly a c. 1800-1805 copy of Gilbert Stuart's Washington portrait made by Chinese artist Foeiqua. This painting is now on display at the New Britain Museum of American Art, where the director says it's raised some real questions: "Should it be at an American art museum? Is it an American work of art? The truth is that it’s a copy of a Stuart made by a Chinese artist for an American collector." Interesting look at early copyright and intellectual property debates. - In the WSJ, Stephen Marche has an essay on the global reach of the Kindle 2, which he says "will likely change our thinking and our being as profoundly as the two previous pre-digital manifestations of text." Marche writes that the Kindle is "a transbook, by which I mean that it is the book which can contain all books. Why are so many writers so afraid of this staggeringly wonderful possibility? A book is a singular object that can contain many voices, but the transbook has the potential to be a singular object containing all voices. It is not just another kind of media; it is the dream of ultimate text." - Liane Hansen talks to Hilary Mantell about Wolf Hall on Weekend Edition Sunday. - Writing in The Times, David Hayles examines the life and suicide of author Robert E. Howard. - Anthony Grafton reviews Donald Kagan's Thucydides and the Invention of History in Slate. - Leslie Klinger reviews the new Dracula "sequel" (Dracula: The Un-Dead) in the LATimes. - Also in the LATimes, Jonathan Handel reviews William Patry's Moral Panic and the Copyright Wars. - In the TLS, John Bowen reviews Michael Slater's Charles Dickens. - Toby Lester's The Fourth Part of the World is reviewed by James McConnachie in The Times. This one's about Ringmann and Waldseemüller's 1507 map, the first to feature "America." - In Books & Culture, Brett Foster reviews Vivat Rex, the new Grolier Club exhibition/catalog marking the 500th anniversary of Henry VIII's reign. - Life of Jeremy Belknap, D. D., the Historian of New Hampshire. With Selections from his Correspondence and Other Writings by Jane Belknap Marcou (New York: Harper, 1847). - Catalogue of the American Portion of the Library of the Rev. Thomas Prince. With a Memoir, and List of his Publications (Boston: J. K. Wiggin & W. P. Lunt, 1868). - Catalogue of the Library of Rev. Thomas Prince, former pastor of Old South Church presented by him to the Old South Church and Society (Boston: Crocker and Brewster, 1846). - The Prince Library (Boston: A. Mudge & Son, 1870). - The Adventures of Telemachus, the Son of Ulysses (Paris: Theophile Barrois, 1798). Usually I just tack new blog-links &c. into the weekly links & reviews post, but I specifically want to point out and urge you all to read Past Is Present, a new blog from the American Antiquarian Society. They're just getting underway, but it's already one of the blogs I most look forward to. One of their many cool features, which appears at the top of the main blog page and also at A Day In the Life of a Blacksmith is the daily diary entries of a blacksmith's apprentice. Add this one to your bookmarks or your RSS reader, today! Back in August I finally got with it and bought an iPod Touch (my first eh, portable music player since I got a "walkman" when I was in about third grade). Since I generally don't listen to all that much music while I'm walking/traveling/&c. I just hadn't seen any particular need for such a thing, but after playing around with the iPod Touch and seeing all the different things it could do (including the very useful wifi capability) I decided to take the plunge. I figured I'd probably use it more for podcasts than for music, and I've found that to be the case: I put out the word on Twitter and asked folks to recommend their favorites, and started listening. I've been surprised at how much I enjoy these. I'm not entirely caught up on them (I don't often have spare hours when I can just sit and listen, and I don't travel all that much) but I listen when I can, and I've been impressed at the high quality and value of these. Good stuff! - "A Prairie Home Companion" - Garrison Keillor's always-amusing "News from Lake Wobegon" segment from his weekly show. - "Car Talk" - I don't know anything about cars, but I absolutely love this weekly call-in car repair show. Good puzzler, too. - "Wait Wait ... Don't Tell Me!" NPR's weekly and must-listen humorous take on the news. One of my favorite things to listen to. - "Bill Moyers Journal" - a podcast version of Moyers' weekly television show, which usually is fascinating. Recent segments I've enjoyed include Rory Stewart on the state of things in Afghanistan and Dr. Jim Yong Kim, the new president of Dartmouth, on public health policy. - "The Economist" - short periodic segments by reporters and editors from The Economist. My favorite of these is "The Week Ahead," in which reporters look ahead to upcoming events (of the sort that aren't usually covered on the network news). - "New Yorker Political Scene" - a short weekly discussion with New Yorker editors and reporters on the political climate of the week. Fairly formal. - "Slate's Political Gabfest" - Slate writers John Dickerson, Emily Bazelon and David Plotz discuss the week's political happenings. Informal, and very funny. - "On Point with Tom Ashbrook" - WBUR's daily news/panel/call-in show. This one is uneven; it can be very good, depending on the topic, but sometimes I don't end up listening if I don't think I'll be interested. - "On the Media" - NPR's weekly examination of media coverage. - "In Our Time" - a weekly show with BBC4's Melvyn Bragg, in which he and a panel of experts discuss a historical event or topic. Recent shows include "Leibniz vs. Newton," "The Death of Elizabeth I," and "St. Thomas Aquinas." - "WNYC's Radio Lab" - Nicely-produced and thought-provoking segments organized around a theme. The show on "Parasites" from a couple weeks ago was disgusting, but intriguing and really well done. - "The Writer's Almanac" - Keillor's daily compilation of anniversaries and literary bon-mots of note, including a poem. - "This American Life" - Chicago Public Radio's weekly series of radio essays. Another of those uneven ones, but usually very good. - "To the Best of Our Knowledge" - I saved my favorite for last. This weekly show from Wisconsin Public Radio and hosted by Jim Fleming, is consistently the one I enjoy the most. The topics and guests are always of interest, and production quality is just tops. The "Libraries" show from late August (featuring Maryanne Wolfe, Ursula Le Guin, Geraldine Brooks, Alberto Manguel, and editor Susan Hirschmann) is just one example of the really excellent program. What am I missing? Anything good out there that I should add to the mix? - At the Christie's Travel, Science and Natural History sale on 15 October (previewed here), the signed Heart of the Antarctic made £15,000, but the paintings were the high spots. A 1615 globe made £44,450 (more than its estimate). The Douglas Adams library globes and the early Spanish equinoctial dial apparently didn't sell. - At the Heritage rare books sale on 16-17 October (previewed here), it was the day for The Federalist. The second volume of the first edition, in a contemporary sheep binding, made $77,675; the first volume, in a Rivière & Son binding, made $71,700 (estimates had suggested the first volume would make more than the second; both about tripled the estimates). Both were sold to phone bidders (or a phone bidder). A signed copy of Casino Royale fetched $50,787.50, and a set of the first four Winnie the Pooh books, each signed by Milne, sold for $23,900. A first edition of Johnson's Dictionary made $14,340. The early Cotton Mather book from Joshua Gee's library didn't sell. - At Heritage's historical manuscripts sale (also 16-17 October and previewed here) the Lafayette letter was the highlight as expected, selling for $31,070 (the same price as a John Coffee order book). The John Adams presidential letter bettered its estimate, making $28,680. - At the Bonhams Fine Books and Manuscripts sale (19 October, previewed here) the Hawaiian mission primer made $7,320; the Herman Melville letter didn't sell. An inscribed first edition Grapes of Wrath was the high spot, selling for $45,750. - Sotheby's London will sell Books and Manuscripts from the English Library of the 5th Earl of Rosebery on 29 October. They've got a cool new e-catalogue feature, too (which unfortunately makes it tricky to link to the lots). Highlights are expected to include a trove of Byron letters to his friend Francis Hodgson (lot 19, estimated at £150,000-180,000); John Speed's The Theatre of the Empire of Great Britain (1676) (lot 107, estimated at £50,000-60,000); Christopher Saxton's 1579 atlas of England and Wales (lot 199, estimated at £40,000-60,000); John Rocque's 1763 Set of Plans and Forts in America (lot 95, estimated at £7,000-10,000). Apologies for the lateness of these this week! 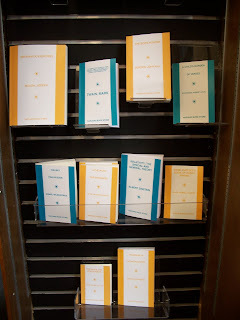 - Chris at Book Hunter's Holiday recaps Terry Belanger's 5 October talk on deaccessioning. - Over at AL Inside Scoop, Bev Goldberg looks at the current state of library budgets. And Scott Douglas uses his new "Dispatches from a Public Librarian" column to plead for additional library funding. - An interview with Hilary Mantel over at The Book Bench. The last couple exchanges made me laugh. Another interview from the Boston Globe. - Nick Basbanes has some new history titles to tickle your fancy. - Over at ephemera, they're looking at a rare and controversial 1819 Declaration of Independence broadside that's currently for sale on eBay. - Rick Ring posts on some early English cryptography books in the PPL's collections. - In the TLS Alex Burghart writes on the recent find of a massive Anglo-Saxon treasure hoard in Staffordshire. - Mark Garvey's Stylized: A Slightly Obsessed History of Strunk & White's 'Elements of Style' is reviewed by Jennifer Balderama in the NYTimes. - Audrey Niffenegger's Her Fearful Symmetry is reviewed by Catherine Taylor in the Telegraph. - Jonathan Bate reviews David Noke's Samuel Johnson: A Life in the Telegraph. - The Twilight Years: The Paradox of Britain Between the Wars by Richard Overy (Viking, 2009). Publisher. - Bright-sided: How the Relentless Promotion of Positive Thinking Has Undermined America by Barbara Ehrenreich (Metropolitan Books, 2009). Publisher. - Samuel Johnson: A Life by David Nokes (Henry Holt, 2009). Publisher. - Pen, Ink, and Evidence: A Study of Writing and Writing Materials for the Penman, Collector, and Document Detective by Joe Nickell (University Press of Kentucky, 2005). Harvard Bookstore. - Empire of Liberty: A History of the Early Republic, 1789-1815 by Gordon S. Wood (Oxford University Press, 2009). Publisher. - The Case for Books: Past, Present, and Future by Robert Darnton (PublicAffairs, 2009). Publisher. - Benjamin Rush: Signer of the Declaration of Independence by David Barton (WallBuilder, 1999). Amazon. - Wolf Hall by Hilary Mantel (Henry Holt, 2009). Amazon. - The Director; a weekly literary journal: containing I. Essays, on subjects of literature, the fine arts and manners. II. Bibliographiana. Account of rare and curious books, and of the book sales in this country, from the close of the seventeenth century. III. Royal institution. Analyses of the lectures delivered weekly. IV. British gallery. Description of the principal pictures exhibited by Thomas Frognall Dibdin (2 v.) (London, Longman, Hurst, Rees, and Orme [etc.] 1807). Harvard Bookstore. - Scrope; or, The lost library. A novel of New York and Hartford by Frederic B. Perkins (Boston: Roberts Brothers, 1874). Harvard Bookstore. - The Bibliographical Decameron; Or, Ten Days Pleasant Discourse Upon Illuminated Manuscripts and Subjects Connected with Early Engraving, Typography, and Bibliography by Thomas Frognall Dibdin (3 v.) (London: Printed for the Author, by W. Bulmer and Co. Shakspeare Press: and sold by G. and W. Nicol, Payne and Foss, Evans, John and Arthur Arch, Triphook, and J. Major, 1817). Harvard Bookstore. - Bibliomania; or, Book-madness; A Bibliographical Romance by Thomas Frognall Dibdin (London: Chatto & Windus, 1876). Harvard Bookstore. I'm leaving nor'easter-drenched Boston this afternoon for a weekend in cooler-but-dry Burlington, VT for the fall meeting of the New England Historical Association. Tomorrow morning I'll be chairing a panel on "Digital History and the Classroom," and in the afternoon I'll be among the speakers at the plenary session, "Museums and the 'Plugged-in Culture: What this Means to All of Us." The trial of Raymond Scott, the, eh, eccentric book-dealer accused of (and recently charged with) the theft of the Durham University First Folio, has been set for 14 June 2010. Prosecutors said they thought the trial would last 6-8 weeks (begging the question of how many different outrageous outfits Scott can pull together before June ...), and will include testimony by several expert witnesses. The October Fine Books Notes and Common-place are out, for your reading pleasure. The former features door-to-door book salesmen, Basbanes on the Getty library, and a roundup of upcoming Poe-related events (among other things). In the latter, Carolyn Eastman discusses "sexing up the pirates," Mark Peterson asks why Hollywood can't seem to get the American Revolution right, and the journal unveils a comments feature. Book Review: "Her Fearful Symmetry"
Audrey Niffenegger's Her Fearful Symmetry (Scribner, 2009) has been long-awaited by fans of her first novel, The Time Traveler's Wife (which I enjoyed back in 2006). While the previous book was engagingly complex, this one is eerily creepy ... there was a point about fifty pages from the end where I wasn't sure I wanted to keep reading (although I knew, of course, that I had to finish the book). Niffenegger's main plot-line here is a grand old ghost story, complete with cemeteries and hauntings and Ouija boards and exploding light bulbs, all that good stuff. But that's not the creepy part. The frame for the ghost story, which encompasses two pairs of twins with incredibly intricate and bizarre relationships (with each other and with those around them) is what makes Her Fearful Symmetry different, and much more haunting than many ghost stories I've read. That said, the primary story (while utterly horrifying, in many ways) ends up being surprisingly predictable, with the exception of a slight (but not altogether unexpected) twist at the very end. I kept hoping that it wouldn't end the way I thought it was going to, but it did. Thankfully, Her Fearful Symmetry (a very apt title) is redeemed by a couple of the fascinating subplots, including the heart-wrenching struggles of a very likeable character (who translates obscure languages and sets crosswords for the Guardian but suffers from severe OCD) to reconcile with his wife, and of the operations of London's Highgate Cemetery, which functions as a backdrop to the whole story. Niffenegger's writing is absolutely charming; she sure can turn a phrase, and she sure can make you love and hate her characters (sometimes both at the same time, even). Her books, even if they don't always do what you think they ought to do, are a pleasure to read (and I think I must add Highgate Cemetery to the list of things I want to see if I ever get to London again). The winners will be announced on 18 November. I've started John Quincy Adams's Shipboard Reading List for October, over at The Beehive. At the moment our intrepid travelers (follow on Twitter here) are still trying to cross the Baltic Sea to get to St. Petersburg, and they're having a rough go of it. For the last week they've been stuck near Bornholm and Christiansoe, making little progress at all (map). But JQA's still reading (lately from Voltaire's history of Russia under Peter the Great, and from Chantreau's voyage into Russia). Joel Achenbach writes in the WaPo today on George Washington's financial records, which were the subject of a recent workshop at Mount Vernon. Scholars are trying to figure out how best to publish the records (many are already online through the Library of Congress, but without transcriptions or interpretation). Fascinating story, and a good project, if funding can be obtained. David Remnick and Henry Finder have edited a second collection of New Yorker humor writing (the first being Fierce Pajamas). Disquiet Please! (Random House, 2008) includes pieces, as the editors explain on p. xiii-xiv "not found in the previous anthology, that made us laugh, or beam, or both. Then, when those proved too numerous to fit into a book, we arranged the pieces in a circle and spun a bottle. Afterward, we recycled the bottle." They note that they skewed toward authors who are "still living, or very nearly; some are even young ... We have erred on the side of newness." Like all anthologies, this one is best dipped into at random, rather than read straight through. And, like all anthologies, not all of the selections are rib-crackingly funny. Some aren't very funny at all. Others are hysterical. Each piece, however, is very New Yorker. So if you like that sort of thing, this book's for you. - Harvard and the National Library of China have reached an agreement under which Harvard's 51,000 rare Chinese books will be digitized and made available free on the internet. The project is expected to take about six years. - Library Journal reported this week that a new company, SkyRiver, will seek to compete with OCLC by providing quality copy-cataloging records to libraries. - In the Boston Globe, Toby Lester writes on the Waldseemüller map of 1507 and its links to Copernicus' heliocentric theory. - The ACRL board has approved new "Guidelines Regarding Security and Theft in Special Collections." - Mark Lamster has a short essay adapted from his new book, Master of Shadows: The Secret Diplomatic Career of the Painter Peter Paul Rubens. - In the NYTimes, Ben Zimmer writes on Bill Safire's "On Language" column. - NPR reported this week on the return of two 16th-century law books to Germany; an American GI took them from a salt mine during the closing days of WWII. - Stephen Gertz looks at the extremely-lengthy subtitles often seen on old titles pages. I love these. - Note: This post is not for real. Glad I checked it out (the final line wasn't there at first) before I got excited (why would I get excited about this? This blog's name comes from The Old Librarian's Almanack). - David Bell reviews Jacob Soll's The Information Master: Jean-Baptiste Colbert's Secret State Intelligence System for The New Republic. - Alison Weir's The Lady in the Tower, a tale of the end of Anne Boleyn, is reviewed by Lisa Hilton in the Independent. - In the New Yorker, Jill Lepore reviews several books on management, including Matthew Stewart's The Management Myth. - A.S. Byatt's The Children's Book is reviewed by Jennifer Schuessler in the NYTimes. - Martin Rubin reviews Hillary Mantel's Wolf Hall in the WSJ. Wendy Smith reviews it in the WaPo, and Stephen Greenblat reviews it in the NYRB. The last deeply examines the question "what is a historical novel?" and makes for very good reading. - Another review of Allison Hoover Bartlett's The Man Who Loved Books Too Much in the San Francisco Chronicle, this one by John Jory. - Alexander Theroux reviews Peter Mancall's Fatal Journey in the Boston Globe. Book Review: "The Baylors of Newmarket"
In The Baylors of Newmarket (iUniverse, 2009), Thomas Katheder has written a biblio-biography of two generations of a Virginia planter family. It is an excellent survey of the literature and sources on colonial and early national-era private libraries in Virginia, including the types of books typically (and atypically) seen, the relative size of collections, and the methods by which books were obtained. Katheder focuses on Col. John Baylor (1702-1772) and his son John Baylor IV (1750-1808). The former's letterbooks, probate inventory and purchase records from the Virginia Gazette allow us to reconstruct his library nearly completely (and I have done so here, by working with Mr. Katheder). The colonel's son added significantly to the library, which numbered between twelve and thirteen hundred volumes at the time of his death. Unfortunately no inventory of the library was made at that time, so we are unable to know with certainty what specific books John Baylor IV added to the collection. Katheder takes a good stab at the question, though, suggesting authors and types of books that John Baylor IV probably acquired during a European stay in the late 1770s (a source he thought might have been a list of books in the collection, however, has turned out to be something different, a list of European authors copied directly from Jedidiah Morse's American Universal Geography). The book itself delves deeply into the transatlantic literary culture of the eighteenth century, and into the precarious financial state of Virginia planters (Baylor would within the span of a few years pay the highest price ever paid in colonial America for a horse - 1,000 guineas for Fearnought in 1764 - and then at his death be deeply in debt, probably insolvent). The curse of the Baylor clan seemed to be that they hadn't much head for business, but they certainly knew and cared about their books. That much is clear from Katheder's fine and detailed study. The endnotes Katheder provides are superb, and add much to the content and context of the study. - Before Darwin: Reconciling God and Nature by Keith Stewart Thomson (Yale University Press, 2007). Harvard Bookstore. - Gould's Book of Fish: A Novel in 12 Fish by Richard Flanagan (Grove Press, 2002). Harvard Bookstore. - Passions and Tempers: A History of the Humours by Noga Arikha (Ecco, 2007). Harvard Bookstore. - Christianity and the Transformation of the Book: Origen, Eusebius, and the Library of Caesarea by Anthony Grafton and Megan Williams (Harvard University Press, 2008). Amazon. - Jacobin and Junto; Or, Early American Politics as Viewed in the Diary of Dr. Nathaniel Ames, 1758-1822 by Charles Warren (NY: Blom, 1968). Harvest Book Co. (via Amazon). - The Baylors of Newmarket: The Decline and Fall of a Virginia Planter Family by Thomas Katheder (iUniverse, 2009). Amazon. - The Curse of the Labrador Duck: My Obsessive Quest to the Edge of Extinction by Glen Chilton (Simon & Schuster, 2009). Harvard Bookstore. One more upcoming notice to add to the others for October: Bonhams New York will sell Fine Books and Manuscripts on 19 October. There will be 525 lots, including books from the surfing history collection of Mark Blackburn. Among the highlights from the sale are a c. 1823 Hawaiian mission primer, described as "only the third surviving imprint from earliest press in Hawaii." It's estimated at $6,000-9,000. A marvelous Herman Melville letter to his British publisher could fetch $60,000-80,000. Publishers Weekly is reporting this afternoon that lawyers representing Google and its partners in the Google Books Settlement told federal judge Denny Chin that they intend to file a revised settlement by 9 November. "The new agreement will include specific amendments designed to answer the objections raised to the deal by the Department of Justice and dozens of other parties and individuals who objected to the original settlement. The lawyers also asked for a limited time to file objections to the amended deal, and asked that new objections be limited to the new amendments. Judge Chin agreed with the timetable and parties hope to have a final hearing in early January. Lawyers for the Authors Guild also asked that a previously scheduled January 5, 2010 deadline - for authors of scanned books to make claims for payments - be extended to June 5, 2010." The report adds that Judge Chin drew laughter when he said the court had been overwhelmed by hard-copy submissions of briefs relating to the case, adding "of all cases this should have a electronic submission process." Heh. Eeeee! Rare Book School, Here I Come! I'm very excited and delighted and thrilled that I have received a scholarship for a course this summer at Rare Book School! Congrats to the other winners, and now comes the fun part: picking which class to take! Harvard's Houghton Library has acquired the papers of John Updike, paying an undisclosed sum for the collection of manuscripts, correspondence and books. The archive spans some 380 linear feet, and includes more than 1,500 books including Updike's copies of his own works and books he reviewed. Updike, a Harvard alumnus, had previously donated a small collection of his papers to Houghton. Excellent news, and a good home for the materials. More at the Houghton blog. The Federal Trade Commission has issued new "Guides Concerning the Use of Endorsements and Testimonials in Advertising," [PDF] which will take effect in December. They suggest that bloggers who receive review copies from publishers must disclose that they've received the books, because a positive review of such would constitute an "endorsement" (would a negative review not count?). There's some discussion and analysis of this at Dear Author, and Edward Champion interviewed Richard Cleland of the Bureau of Consumer Protection here. Just about the only thing that's clear is how muddled these standards being put forth are: what precisely triggers an "endorsement," the liability of publishers in what is said about their works by bloggers, what the blogger does with the product after it's reviewed and whether that changes the equation, &c. &c. Cleland told Champion that if a blogger received review copies of books and reviewed them, the blogger would then have to return the books in order for the review not to be considered an "endorsement" of the product. Champion writes: "Cleland insisted that when a publisher sends a book to a blogger, there is the expectation of a good review. I informed him that this was not always the case and observed that some bloggers often receive 20 to 50 books a week. In such cases, the publisher hopes for a review, good or bad. Cleland didn’t see it that way." I can honestly say no publisher has ever stopped sending me review copies after I've written a negative review of one of their books. And I've written some very negative reviews. I don't think there is any expectation of a positive review: there's an expectation of a review, and that's fine, but to suggest an automatic expectation of positive endorsement is, I think, entirely wrongheaded. Look at the LibraryThing Early Reviewers program - 31 publishers this month alone have provided 1590 copies of 55 titles for readers to review, with the explicit understanding that an honest review is the goal, not a positive one. But then there are the perfectly reasonable scenarios Champion lays out to Cleland: "He didn’t see any particular problem with a book review appearing on a blog, but only if there wasn’t a corresponding Amazon Affiliates link or an advertisement for the book" (so every review I've ever posted, whether I got the book from the publisher or not, would be fine, since I don't link to Amazon). BUT ... "A book falls under 'compensation' if it comes associated with an Amazon link or there is an advertisement for the book, or if the reviewer holds onto the book" (so if I receive a book from the publisher, review it, and keep the copy, that's an endorsement?). Then there's the question of what disclosure constitutes - would it have to be noted in each review? Or some blanket statement that would cover all reviews? Or would regularly noting how books are acquired (as some of us do every week) suffice? Many more questions than answers. I think I and many others will just keep doing what we're doing, unless we're told otherwise. Brian Kenney, the editor-in-chief of School Library Journal, has issued an open letter to the parents of students at Cushing Academy (the MA prep school which recently announced it would be getting rid of its books in favor of an all-electronic 'learning center' - see my post on the announcement here). Kenney's letter is spot-on. I hope it will be widely read. Book Review: "The Man Who Loved Books Too Much"
Allison Hoover Bartlett has turned her 2006 San Francisco Magazine article "The Man Who Loved Books Too Much" into a book by the same name (Riverhead, 2009). The subject is John Charles Gilkey, longtime book thief and crook-of-all-trades, who has stolen (and most likely continues to steal) from book dealers and libraries around the world. Bartlett widens her scope to encompass those who've sought to put a stop to Gilkey's thieving ways, most notably book dealer Ken Sanders. And she includes herself in the story, becoming a part of the Gilkey saga in ways I suspect she never anticipated when she began the research for what would become this book. In many ways similar to Miles Harvey's superb The Island of Lost Maps (which treats map thief Gilbert Bland), The Man Who Loved Books Too Much is dissimilar in one crucial respect: the thief talked. Bartlett met with Gilkey multiple times over a two-year period, and was able to add his perspective to her work. That perspective adds much to the work, even though it quickly becomes clear that Gilkey's playing Bartlett the same way he'd played every employer, book dealer, and librarian he's had dealings with. Gilkey's willingness not only to talk with Bartlett but also to boast about his crimes even directly in the faces of his victims is quite stunning. He and Bartlett even go so far as to visit Brick Row Book Shop, where owner John Crichton (who's lost books to Gilkey in the past) recognizes Gilkey and is forced to look on as the thief, his reporter in tow, browses his stock and complains loudly about the practices of book dealers. Gilkey stole, at least at first, almost exclusively from book dealers. From his conversations with Bartlett, she gathered that this seemed to be because he felt that because he loved books, he ought to be able to have whichever ones he wanted: "for Gilkey," she writes, "'fairness' seemed to be a synonym for 'satisfaction': if he is satisfied, all is deemed fair; if not, it isn't" (p. 50). Because he wanted the books, he said, he ought to be able to get them, and if he could get them for free, all the better. By stealing credit card receipts and calling in orders using the snagged numbers, or passing bad checks, Gilkey accumulated thousands of books from shops up and down the West Coast. Bartlett writes that he seemed to have no concept of the fact that what he was doing was wrong - he didn't seem to think that stealing from dealers could possibly be inappropriate (although, as she notes, he did seem careful not to use words like 'steal,' 'prison,' or 'theft'. "Instead, he 'got' books and has been 'away' for 'doing that.'"). Naturally, things progressed, and even during the course of reporting for the book, Bartlett learned that Gilkey had begun stealing maps and other rare materials from libraries: on p. 181, she writes that she asked the thief "'Have you ever taken a book from the library?' ... Gilkey looked incredulous. 'No,' he said. 'That would be stealing.' I had no idea what to say." By p. 240, he's admitted to stealing dust jackets and cutting maps out of library books. "So much for not stealing from the library," Bartlett notes. This wasn't the only crime Gilkey confessed to Bartlett, but she writes that it was the first one that made her question whether she ought to inform someone. And here's where she ran off the rails, as far as I'm concerned. Bartlett writes that she consulted several lawyer friends, as well as her literary agent's attorney, about whether she had an obligation to inform the authorities of Gilkey's crimes. They told her she had no legal obligation. Bartlett: "But what about ethical responsibility? The difference between the two was as blurry as my role, which had shifted from observer to participant in Gilkey's story. Did I owe this information to dealers, who had been so helpful with my research? But if I notified them of these thefts, wouldn't Gilkey keep all future and possibly more significant thefts from me? ... I found myself teetering between selfishness and benevolence: either reveal the secrets Gilkey had shared with me, probably losing access to him and possibly sending him to jail, or keep them to myself and be unjust to his victims. I tried to reassure myself that such consequences were not directly my responsibility." Two months later, Bartlett says, she called the FBI and talked to Art Crime Team head Bonnie Magness-Gardiner, who explained the circumstances in which federal agencies would get involved with book crimes. Asked directly "You'd tell me if the the book thief had stolen anything, right?" Bartlett said she would, but failed to inform Magness-Gardiner of several unprosecuted thefts (plus credit card fraud) she knew of ... justifying this, she said, with the fact that she later determined that the statute of limitations had passed (p. 241-42). While whatever library crimes Gilkey confessed to Bartlett probably weren't federal offenses, for her to slough off the responsibility of reporting them so easily and carelessly is absolutely reprehensible, and to have literally lied to the FBI about thefts of which she was aware is pretty rotten as well. She ought to be ashamed of herself. Bartlett chronicles Gilkey's run from both his perspective and from the viewpoints of those he victimized and those who sought to catch him. Her interview with still furious (and justifiably so) dealer Lane Heldfond is one of the most interesting parts of the book, and her profile of Gilkey pursuer Ken Sanders is mostly fair and appropriately-drawn. She pads the narratives with tales of past bibliomaniacs (many of which are straight from Basbanes' A Gentle Madness), and with material from some recent works on collecting. She tries to present Gilkey as someone interested in books and literature, and it's clear that he is that, but at heart he is also a con man and a thief, pure and simple. He likes getting things for free (travel, hotels, food, as well as books), and he feels no remorse in getting away with illegal activities. Bartlett also adds some revealing information (which again points to the notion that she was getting far too chummy with her subject, I think); he starts telling her that he's thinking up "a grand finale," a way to obtain all 100 books from the Modern Library's list of the 100 Best Novels of the 20th century. He's a showman, an attention-seeker, an incorrigible thief. That he happens to like books doesn't make him any more likeable, it makes him that much more dangerous to all of us to sell, protect, collect and love them. This is a well-written book, that tells a good story. Kudos to Bartlett for getting Gilkey to talk. But reading about his lies, his crimes, his manipulations of those around him just made my skin crawl. He deserves to be in prison for the rest of his life. As Bartlett notes in the afterword, Gilkey couldn't be stopped: just before the book went to press, he stole a book from a Canadian dealer. I'm sure it's not the last time. 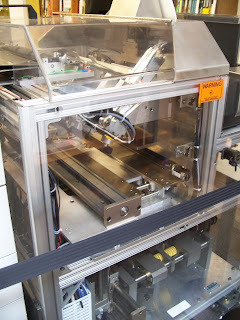 We trekked out to Harvard Bookstore today to check out the new print on demand machine (aka the book-making robot). I snapped some pics of the sample books they had printed out, and of the machine itself. Unfortunately the "print guru" wasn't in so I didn't get to see the machine in action (but don't worry, I'm going back out on Thursday for that, armed with a list of titles to have printed). I think one of the most practical uses of this machine will be to get cheap reading copies of antiquarian / out-of-print titles - for $8 apiece, why not? Of course the same dilemma that you always get with Google Books is a problem here - if the scan is bad, the printed copy will be bad too (they'd printed a sample copy of Joseph Moxon's Mechanick Exercises, in which almost all the illustrations were partially obscured). So, before you order, I'd check the scan and make sure it's up to par, so you're not disappointed with the end result. The covers are nothing special (just slightly heavier paper stock), but the binding's just about the same as any trade paperback book these days (i.e. not great, but serviceable). I'll probably have more to say after I've seen the machine actually working, but so far, I'm intrigued. - The October Americana Exchange Monthly is up, here. Lots of good offerings as always, including a report on the "Books in Hard Times" conference drawn from my recap of the event. - A WHYY Edgar Allan Poe short film which our guy Ed was involved won a Mid-Atlantic Emmy for Historic/Cultural-Program Feature or Segment. You can watch the short here. - BookTV has an interview with Allison Hoover Bartlett about The Man Who Loved Books Too Much, her new book about book thief John Charles Gilkey. You can watch online, or check the CSPAN2 listings for air times. - Writing for Publishers Weekly, Andrew Albanese asks "Can the Google Book Settlement Be Saved?" And in the NYTimes, Kenyon College professor Lewis Hyde writes the most cogent essay I've seen throughout this debate on the question of orphan works. This is the must-read of the bunch. - A malfunctioning sprinkler caused damage to documents at the Missouri State Historical Society this week, according to media reports; thankfully the documents were duplicate state files from the 1970s-90s, and can be replaced. - Over at Boston1775, J.L. Bell notes a new issue of the online magazine History Now, all about the American Revolution. I'm looking forward to making my way through the articles. - The Ig Nobel Prizes were awarded this week (full list of winners), and this year's list included the first award for literature; it went to "Ireland's police service (An Garda Siochana), for writing and presenting more than fifty traffic tickets to the most frequent driving offender in the country - Prawo Jazdy - whose name in Polish means ‘Driving License.'" - Christine and Robert at Colophon Books have added a subject-based index to their website, so if you just want books on forgery, wood engravings, or book auction catalogs, &c., this will be a handy way to browse their holdings. - The National Heritage Museum's exhibit "Freemasonry Unmasked!" opened on 3 October. The show "features forty objects from the Library and Archives collection, ranging from 1700s and 1800s ritual exposures to an anti-Masonic comic book from 1978." - Annette Gordon-Reed's The Hemingses of Monticello has won the $25,000 Frederick Douglass Book Prize for 2009, an annual prize awarded by Yale University's Gilder Lehrman Center for the Study of Slavery, Resistance, and Abolition for "the best book written in English on slavery or abolition." - James Cummins has issued a "Books About Books" list (PDF). - Maureen Dowd's NYTimes review of The Lost Symbol is a must-read. - Miranda Seymour reviews Jenny Uglow's A Gambling Man: Charles II and the Restoration in the Telegraph. - Allison Hoover Bartlett's The Man Who Loved Books Too Much is reviewed by Christopher Beha in the NYTimes. - In the Guardian, Philip Pullman reviews Joscelyn Godwin's Athanasius Kircher's Theatre of the World. - Audrey Niffenegger's Her Fearful Symmetry is reviewed by Tom Adair in the Telegraph. - Paul Collins' The Book of William gets a short review in the NYTimes. - In the TLS, Mary Beard reviews Margaret Miles' Art as Plunder and Carole Paul's The Borghese Collections and the Display of Art in the Age of the Grand Tour. - Frances Wilson reviews Dan Cruickshank's The Secret History of Georgian London in the Times. - A.S. Byatt's The Children's Book is reviewed by Brooke Allen in the WSJ. Here's what appeared this week. - Mr. Langshaw's Square Piano: The Story of the First Pianos and How They Caused a Cultural Revolution by Madeline Goold (Blueridge, 2009). Publisher. - The Man Who Loved Books Too Much: The True Story of a Thief, a Detective, and a World of Literary Obsession by Allison Hoover Bartlett (Riverhead, 2009). Strand (this one I got while I was in NYC, but forgot to add earlier because I was already reading it when I added the others). - Enemies of the Bay Colony: Puritan Massachusetts and Its Foes by Philip Ranlet (University Press of America, 2006). Amazon. - Christie's South Kensington will hold a sale of Travel, Science and Natural History items (292 lots) on 15 October. This is a neat sale, with artwork, books and artifacts all on the block. A pair of 1797 library globes made by London's Douglas Adams is expected to fetch £30,000-50,000; a silver/gilt equinoctial dial made in Madrid in 1600 could sell for £15,000-25,000; Shackleton's 1909 The Heart of the Antarctic (one of 300 sets signed by all members of the shore party and once owned by explorer Vilhjalmur Stefansso) is estimated at £12,000-18,000. - Heritage Auction Galleries will sell rare books on 16-17 October (1037 lots). A huge sale, with some noteworthy things, including a the first volume of the first compiled edition of The Federalist in a Rivière & Son binding (est. $25,000); (you can also pick up the second volume, in a plain-but-contemporary sheep binding, for est. $20,000); a 1690 Cotton Mather Boston imprint from the library of Rev. Joshua Gee ($15,000-20,000); an inscribed copy of Casino Royale (est. $40,000). There are oodles of lower-end things in the sale too, so some bargains might be possible. - Heritage is also selling historical manuscripts on 16-17 October (274 lots). Highlights are expected to include an 1825 Lafayette letter to Congress (est. $30,000-40,000); a John Adams presidential letter (est. $18,000-25,000); and an 1858 Abraham Lincoln letter (est. $50,000-75,000).